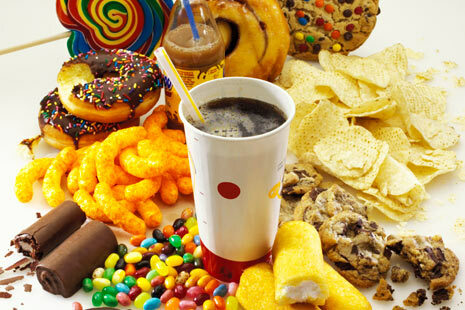 Candy, soda and fast food are not driving the rising obesity trend in the U.S., according to Cornell Food & Brand Lab. Soda, candy and fast food are often painted as the prime culprits in the national discussion of obesity in the U.S. While a diet of chocolate bars and cheese burgers washed down with a Coke is inadvisable from a nutritional standpoint, these foods are not likely to be a leading cause of obesity in the U.S., according to a new Cornell University Food & Brand Lab study conducted by lab co-directors Drs. David Just and Brian Wansink. The study, published in Obesity Science & Practice, finds that intake of these foods is not related to body mass index (BMI) in the average adult. Just and Wansink reviewed a nationally representative sample of adults in the U.S. and found that consumption of soda, candy and fast food is not linked to BMI for 95% of the population. The exception is those who are on the extreme ends of the BMI spectrum: those who are chronically underweight and those who are morbidly obese. Given that there was no significant difference in consumption of these indulgent foods between overweight and healthy weight individuals, the researchers concluded that the overwhelming majority of weight problems are not caused by consumption of soda, candy and fast food alone. "This means that diets and health campaigns aimed at reducing and preventing obesity may be off track if they hinge on demonizing specific foods," Just explained. "If we want real change, we need to look at the overall diet and physical activity. Narrowly targeting junk foods is not just ineffective, it may be self-defeating as it distracts from the real underlying causes of obesity." These findings suggest that clinicians and practitioners seeking to help individuals obtain a healthy weight should examine how overall consumption patterns, such as snacking, and physical activity influence weight instead of just eliminating "junk foods" from patient's diets. More information on the study is at http://foodpsychology.cornell.edu/OP/fast_food_science#.